RISE FROM ASHES: Diego Pacheco, owner of Coqui Mexicano restaurant, said Melrose has become safer in the past decade. 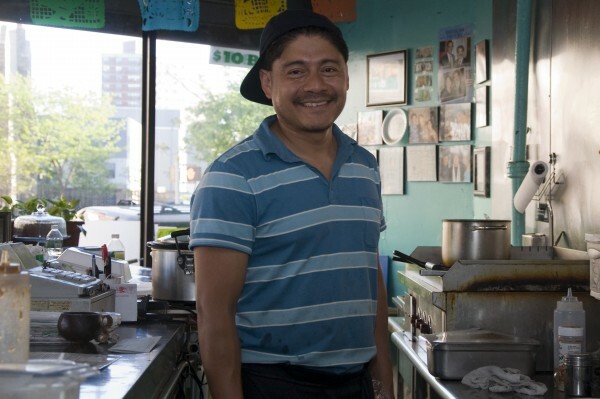 BRONX – Behind the counter of Coqui Mexicano, Diego Pacheco spends all day watching the world go by on Third Avenue in Melrose. Pacheco, who opened the restaurant three years ago, said he has seen many changes to the neighborhood since he moved there in 2001. Even then, decades after the neighborhood became a national symbol of urban blight, buildings were burning, Pacheco said. He pointed out the window towards a charred, red-brick building with a missing roof. That should come as no surprise, considering the neighborhood’s troubled past. In the 1970s, this part of the South Bronx became infamous for its high incidences of arson and empty lots. Gang violence and drug abuse ravaged the area in the 1980s and into the 1990s. It became known as one of the most dangerous and least desirous places to live in the city. But now, it seems, the South Bronx is about to have its moment. With dozens of new housing developments and thousands of new residents, Melrose is one of the fastest growing neighborhoods in the city, according to census figures. There are three main reasons for the welcome sings of growth, experts say. The neighborhood has benefited from the historic reductions in crime that have made New York the safest large city in the nation over the last 15 years. Decades of planning and grassroots movements to build new housing have finally come to fruition. And the low cost of the housing and its proximity to Manhattan have attracted newcomers. Some of the area’s developments are commercial, like the 18,000 square-foot Staples in the Third Avenue Hub, which opened in 2007. Others are residential, like La Casa de Felicidad, which offers its 84 units to low-income senior citizens. Some buildings, such as the townhouses on Courtlandt Avenue between East 159th and 160th streets, are mixed-use or are reserved for moderate-income families. Evelyn Ortega, who works as a waitress at Dallas BBQ on the Upper East Side, moved from East Harlem to her multi-family home on E. 154th Street in 2006 because she wanted to own property, she said. The married mother of a three-year-old son said the Bronx was the only place she and her husband could afford. David Kopstein, whose family has owned the Brook House furniture shop across the street from Pacheco’s restaurant for 51 years, said the changes are attracting new types of residents. The population growth can be seen across racial lines – Hispanics and African Americans, the two dominant groups in the neighborhood, went up 8 percent and 17 percent respectively, while the small white and Asian populations rose 7 percent and 74 percent. See how Melrose has changed. 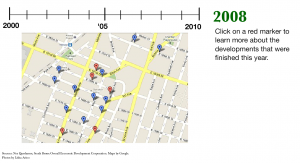 Click on the image for an interactive housing timeline. Melrose still has a way to go before it’s fully developed, noted Darada David, the owner of PeaceLove café. She said the neighborhood needs a centralized shopping, dining and entertainment district to put it on par with more trendy neighborhoods in the city. Ortega believes the neighborhood needs more parks and places for kids to hang out. She also wants more shopping options. “I think they need to bring an Old Navy here, even a Wal-Mart. I wouldn’t mind,” she said. Kopstein pointed across the street from his store to Boricua Village, a 4.5-acre complex that, when completed, will have a college, 744 apartments and several blocks of storefronts. The old courthouse, also across the street, is being restored and will be rented out as office space, he said.